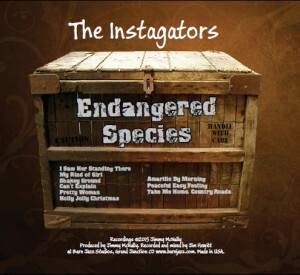 The first CD from The Instagators in over 20 years features rock wizard Jimmy McNally on guitar, vocals, keys, and harmonica, Mike Williams on Bass and vocals, Robb Lasater on drums, with appearances by several other local guest artists, including yours truly, “Diamond Jim” on fiddle and mandolin. The project took 4 months to record and mix at Barn Jazz Studios. The songs are mostly classic rock covers from the Beatles to Roy Orbison, reflecting the kinds of music that local Grand Junction fans have come to expect from these talented musicians. However track 2, “My Kind of Girl”, is an original by McNally. This is by far the most interesting track and is worth the price of admission. Hopefully their next CD will have more of Jimmy’s original tunes. 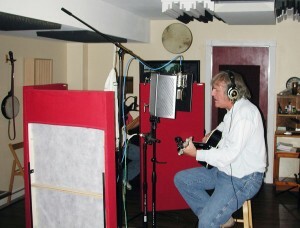 The CD is available directly from Jimmy McNally. If you would like to order a copy send a check for $12.00 to Barn Jazz Productions, PO Box 1826, Grand Junction, CO 81502 along with your address and I will make sure Jimmy gets one in the mail to you right away. In the meantime if you are in the Grand Junction vicinity you can catch the Instagators (and their new CD) most Friday and Saturday nights at Le Rouge downtown. See their Facebook page for more into (just search for Instagators, and mind the spelling). I just found a nice explanation from L.A. recording engineer Ronan Chris Murphy as to why its not always a good thing to record vocals in a small vocal booth. I had considered adding one at much expense. Instead I employ a small absorber called a “reflection filter” around the back of the mic as shown here. This gives the mic more focus without complete isolation. 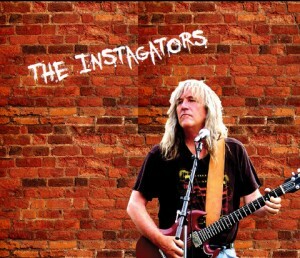 Just added a new client, The Instagators, a Grand Junction favorite rock group. These guys are for real. 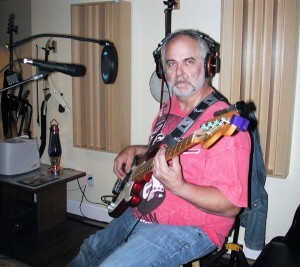 Jimmy McNally is a very talented guitarist, singer, composer, keyboard player, you name it. With Mike Williams on bass and Robb Lasater on drums, they rock downtown GJ on a weekly basis. I have played with them on occasion and enjoy their energy and musicianship. So a few weeks ago I get a call from Jimmy. He wants to make a CD of tunes that they play regularly at their gigs. So we get started recording 10 tunes. You can see some pics from the studio work in the slide show. The CD should be finished sometime in early 2015. I posted the first complete song, Holly Jolly Christmas, on the playlist on the home page. Holly Jolly is a favorite with the locals, especially when played on a hot summer night in July! You may be hearing it on the local community radio station, KAFM. This started out as a spacey electronic audio work that imagines a lost space probe encountering a black hole. Then coinciding with the 45th anniversary of the Apollo 11 moon landing, I added footage from NASA and some visualization to spice it up as a video. As a child I built lots of space ship models and still read lots of Sci-Fi. Think of this music video as a requiem for our abandoned space program. Event Horizon from Jim Hewitt on Vimeo. I recently hooked up with Len Willey and the Prairie River Band as their lead fiddler and mandolin player. This is a fine group of acoustic musicians, playing old timey songs with a dash of Celtic and bluegrass. Our first gig is coming up at the end of April. Peagreen is an old fashioned grange hall located out in the farm and ranch country southwest of Delta, Colorado. At these Saturday night concerts the place is packed. Hope you can come out for great music and food. 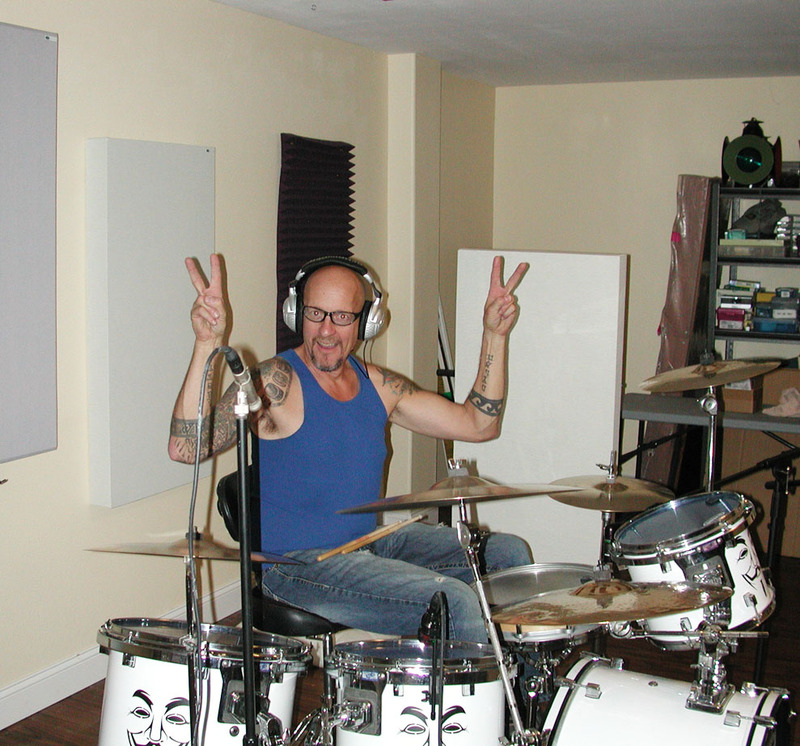 Barn Jazz Productions is proud to announce that our new recording studio is open for business! All the hard work of wiring, construction, acoustic treatment, and configuration of gear took some time but the wait was worth it. Here is a photo of the new space. We now have room for an entire band, a luxury that we did not have in our prior space. If you would like to book some time please send me a message using our Contact Page and I will get back to you promptly. Here are some before and after photos. Just completed my first live performance with Way Down Yonder, a long-time Grand Junction bluegrass band, at Pea Green on Dec 22, 2012. Yes you heard that right, Pea Green is a performance hall located out in the fields and farms of Delta, Colorado, and a nicer and more appreciative crowd cannot found. We had a great, and opened along with the McCoys for my favorite local band, Stray Grass, one of the Western Slopes best known outfits. 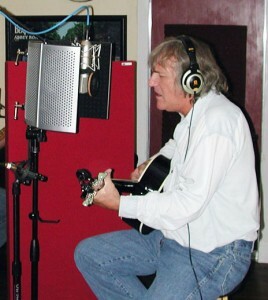 Way Down Yonder consists of myself on fiddle, Joe “Que” Quesenberry on mandolin, Dennis Costlow on banjo and lead vocals, Carol Quarrels on guitar and vocals, and Big Dog Kyle on acoustic bass. 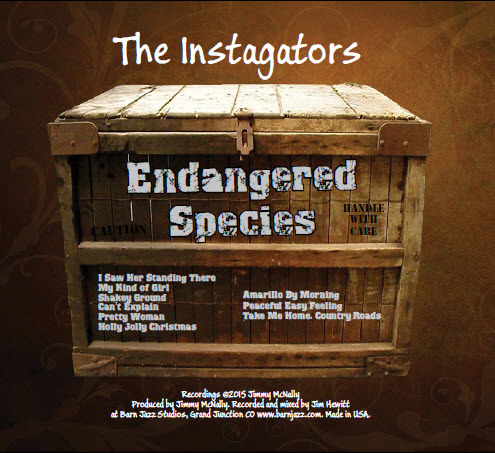 My latest CD is complete! Started work on it in 2005, received the final master back from Bob Speer at CD Mastering Services in April, got the first 100 pressings from Discmakers last week. Sounds really good, and great feedback from the first few people to get a copy. Cover art courtesy of John Medley, Oracle AZ, from his collection of vintage vegetable crate designs. By the way if you go to CD Baby you can preview some of the tracks to get an idea of what this barn jazz stuff is all about. I would really appreciate a review if you find the music worth the time.